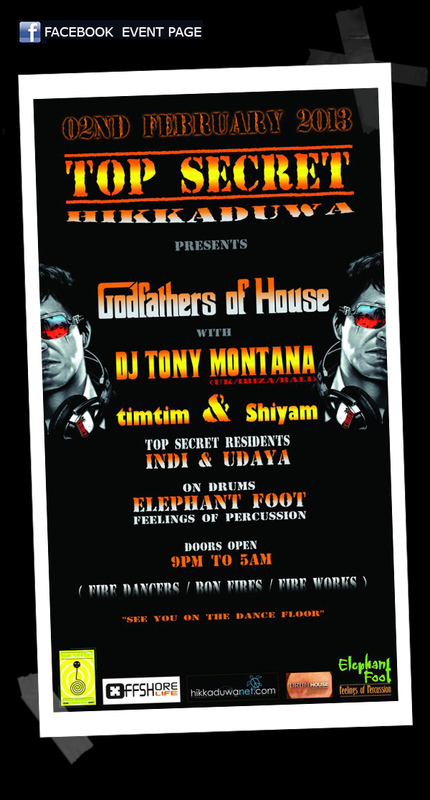 Top Secret Beach Bar Presents, Master of House Music Dj Tony Montana @ Hikkaduwa on 2nd Feb 2013. Including Guest DJ's TimTim, Shiyam & Top Secret Resident DJ's Indi & Udaya. Also Performing Live on Percussion's, Sri Lanka's best Drummers Elephant Foot. Join in for a night of great music, beautiful people, bonfire, fireworks and super vibes! See you on the Dance Floor!